He is survived by his sister, Helen Stubbs of Caledonia and her late husband Jack. Predeceased by his parents, Gordon and Leta Reid, sister Lorraine Reid, sister Eleanor & her husband Lorne Cummings and Janet’s parents, Andy & Margaret Gushart. Keith was born on October 2, 1940 and grew up on the Reid home farm on the 1st Line at Hagersville and left school to come home and farm with his dad. He met Janet on a blind date and they married and bought a farm just north of Jarvis where they kept a small herd of Angus cows under the Reidholm Farms prefix, which is still active today. Keith commuted to work at Stelco in Hamilton in his VW bug and Janet taught Home Economics. Opportunity called in the late 1970’s with the chance to move the whole family north, including Gramma Gushart, to pursue Keith’s dream of having his own welding/manufacturing business – JK Reid Mfg. – with Janet’s full support every day. 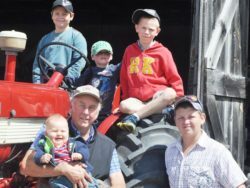 Keith was so fortunate to see the business grow – with his three kids involved – to what it is today, building and sending livestock and gaming/zoo equipment all over the world. Keith was so proud that the small business he and Janet built manufacturing livestock chutes, gates and anything else a friend, neighbour or customer needed built, had evolved into more than he could have ever imagined. He played a big role in his kids starting their own businesses too – RK Animal Supplies and RK Cattle Co. – and supporting them with whatever they needed to be successful. Keith was a fan favourite wherever he went, and he was always ready to share a story – new or old, long or short – and made time for everyone. He loved taking his old MH 22 to plowing matches and catching up with old friends and, don’t kid yourself, he checked the lunch menu before he left! He also cherished every moment spent with his five grandsons on their many adventures showing their calves, going 4-wheeling, runs to town for parts or cat food and, most importantly, detours to McDonalds for “snacks” close to mealtimes. They are so lucky to have had him in their lives. And we can’t forget his dog, Buffy. She was his very best bud and travelled with him everywhere. He’ll be so happy to be reunited with her. Keith will be missed so much, and we are completely heartbroken. Please write down your favourite memories of Keith and drop them off at the shop or bring them to the service for the family, so they can reflect and appreciate the lives he has touched and the memories he leaves behind for all of us to cherish. A Celebration of Keith’s life will be held at the Drayton United Church, 34 Main Street E., Drayton, ON, on Saturday, April 6th at 11:00 a.m. with lunch and fellowship immediately following the service. Spring interment in Derryadd Cemetery. As expressions of sympathy, donations to the Heart and Stroke Foundation or the Canadian Cancer Society would be appreciated by the family.